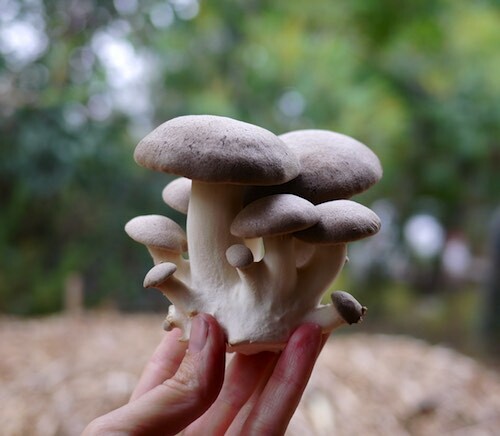 Grow your own’s oyster mushrooms – delish! At Milkwood Farm, we’ve opted to grow our oyster mushrooms in double buckets. 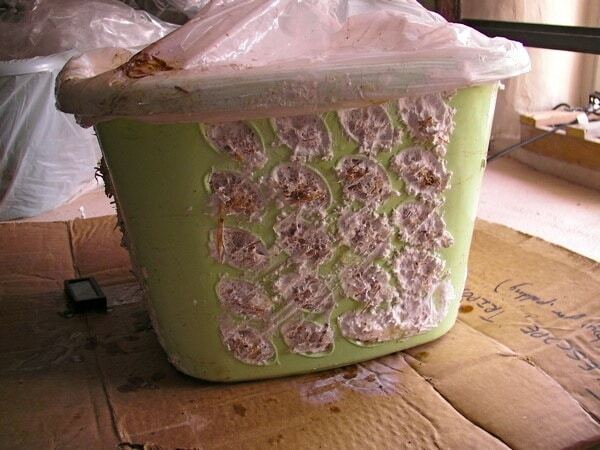 We chose this technique to alleviate the need to bag or box the inner bucket to maintain humidity and isolate the substrate (because that’s the outer bucket’s job), and also to ensure that the plastic that the mycelium is in is food grade. 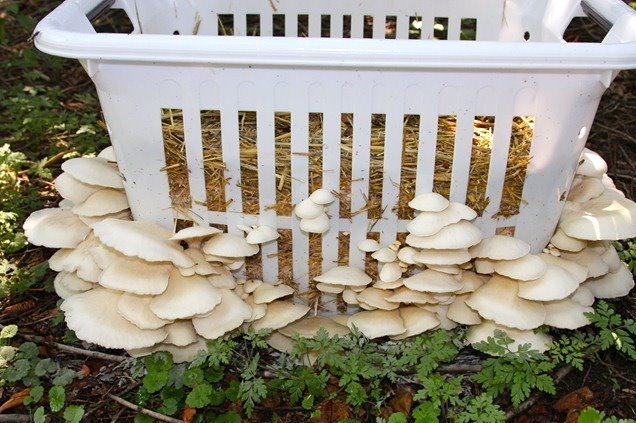 However, many home mushroom propagators use the laundry basket technique, and it illustrates yet another way oyster mushrooms can be grown inside, outside and upside down, once you have the basic knowledge, skills, tools and of course mycelium… mmm mushrooms. 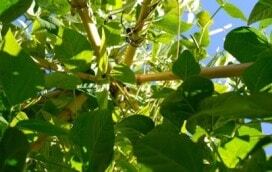 Join a Milkwood mushroom cultivation course and leave with all the knowledge and skills you’ll need to get growing mushrooms inside and outside, in all sorts of ways. 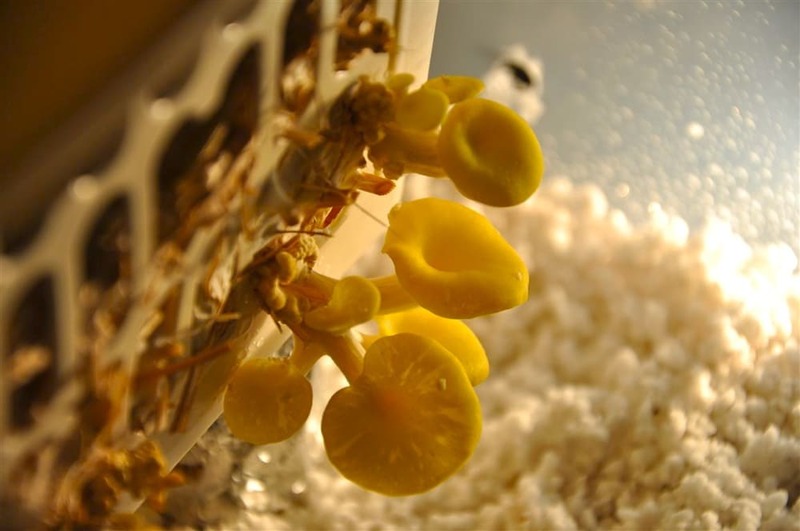 We also supply students with multiple strains of mycelium in petri dishes, inoculated shiitake logs, fruiting bags of mushrooms and heaps of other resources. Yummo. 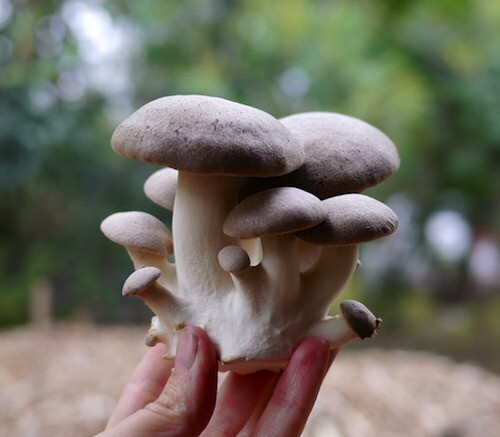 Here's how we made a DIY off-grid mushroom fruiting house - for c . . I grew oyster mushrooms at home. I found them easy to grow but missing the tasty nuttiness of wild mushrooms. Have you tried growing any other types? This is brilliant… I will try this next year. 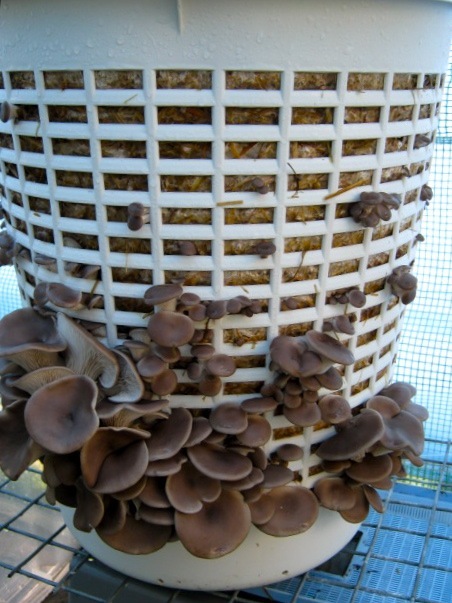 check out this great post on growing mushrooms in hay in a laundry basket. We just so happen to have a derelict laundry basket, some hay and a shady spot so we’re going to give it a go. Hello! I love this thread! We have many grows of different species of oysters at shroomology, using this exact method! I am posting a link to this thread on my website, we have quite a few VERY experienced cultivators that would love to look around here. 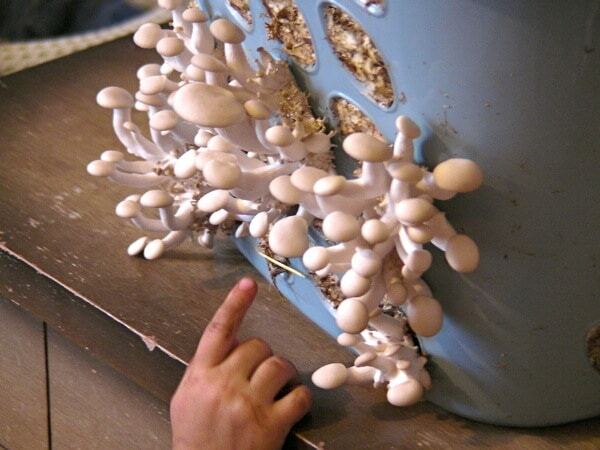 Check out our blue oyster in a basket grow! Where do you get the mycelium? Could this be done with similarly-perforated ceramic jars, perhaps? This looks very cool! Can’t wait to try it! Thanks for sharing. 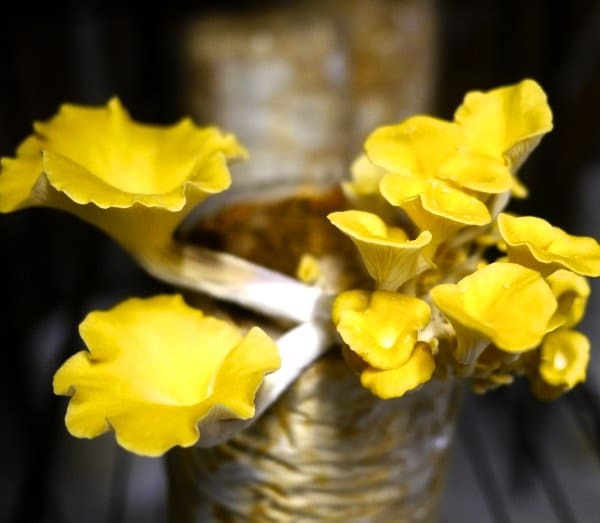 If you come up with a way to grow Chanterelles in a basket, let me know!! I tried batter fried home grown oyster mushrooms last summer. Heavenly! I’m interested in trying this but it’s so hot and dry in Okla. If have a large partly shaded green house, can I grow mushrooms in it? if you keep the moisture temps right, yes! If I wanted to grow button mushrooms, would it be possible to purchase close-gilled ones from the grocery store, slice them open, and place them in the growing medium? how do you water the basket? This might be a dumb question but there was mention of food grade plastic buckets for safety. How do we know if the types of plastic used to make the different kinds of laundry baskets is not going to be a health concern? well, to be blunt, you don’t. But the theory is working off the fact that mycelium are incredible selective about what they ingest – and in the case of edible fungi like oysters or whatever, plastic is not on that list. the other aspect is that unless you’re talking log-grown shiitake, all commercially cultivated mushrooms are either grown in plastic of one type or another, OR in the case of compost-grown button mushrooms, they’re doused with selective fungicides to ensure nothing competes with the chosen fungi… so… hmm. If you are worried about the plastics, you could easily make a cage out of chicken wire. It’s pretty inexpensive at your local feed supply. It wouldn’t be as portable, but if you don’t need to move it, you should be set. Could I do this with woodchips or does it only work with straw? considering mushrooms decompose organic as well as inorganic material very quickly do you feel it is wise to be growing mushrooms for consumption in petrochemical based containers? Oysters metabolize hydrocarbons into edible mushrooms, for this reason they are used on deisel spills and other sites. 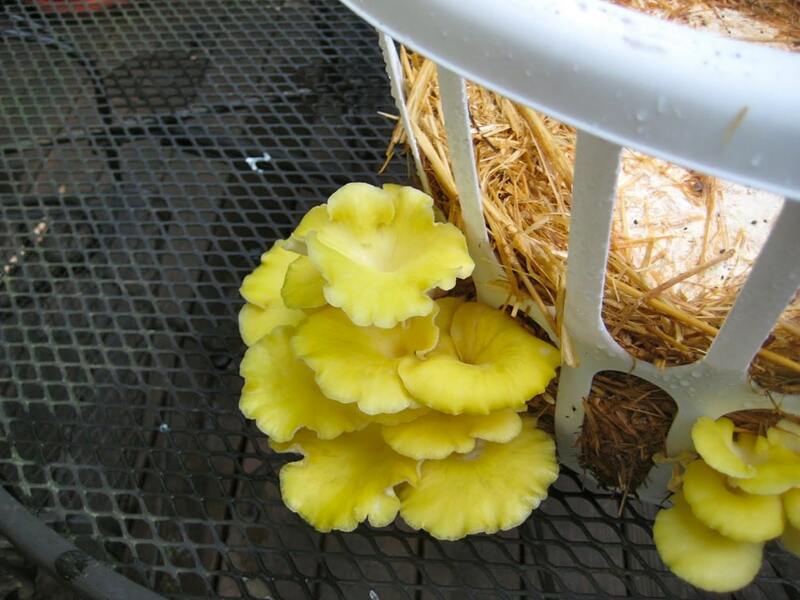 Can you grow Chanterelle Mushrooms with the laundry basket method as well? How about Morels? Thanks for your up vote on my recent comment on the NY Court: Farmers to be re-educated; it led me here. I’ve been looking for a ‘great idea’ I could effectively manage and learn. We have an ideal spot and it’s along shaded fencing area that get some run off from the carport decking. Shade and moisture is a constant and we live in the Philippines. You will be hearing more from me about this shortly. could you grow hen (or chicken) of the woods using this method? I thought that mushrooms have to be in a cool dark place?